Located a few miles from the center of Lucca, designed by the famous Lucchese architect Lorenzo Nottolini began as a stall at the foot of the Observatory. The current owners have restored the old barn, with dazzling care and dedication in order to maintain the original architecture and colors at the same time and achieve a particular class of home and comfort. The care of the interior and finish make it a place well suited to the vicinity of the famous Villa Reale. Besides the peace and tranquility you will have the opportunity to visit the city of Lucca, which is only 8 km, or reach the famous Versilia coast (25km). Outside there is provided a large porch furnished with tables and chairs, barbecue and wood oven to cook outdoors and enjoy the exceptional climate. The house stands in a panoramic position on the city, and from windows features dovetail, you can enjoy a fantastic view. The garden, well maintained and spacious, ideal to rest in the hot summer days in the shade of trees. 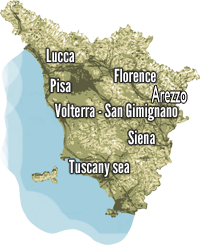 Upon arrival you will receive a warm welcome from the owners that we are sure you will feel part of this fantastic area that is Lucca. Especially recommended for visits to cities of art, for the comfort and care of furnishings. Owner leave close the house and can help you for all needs and whishes. It can accommodate up to 8 people. Ground floor are two large bedrooms each with own bathroom overlooking the garden through a large door window that gives the room an inviting atmosphere. On the first floor a large salon which offers a breathtaking view over the city of Lucca. The lounge has 4 sofas framing a large fireplace cheer up winter evenings. Also on the first first floor there is a third bathroom and kitchen with kitchenette consists of 4 ring electric hob, fridge with freezer, oven, microwave, coffee machine, dishwasher. Access to the first floor is through a wrought-iron elevator. The decor is very nice as well as finishes. The swimming pool is an above ground pool which measures 8 x 4 mt with a depth of 1.30 mt. It has a staircase that leads the access from and outside the pool. The swimming pool is open from the last Saturday of April to the first Saturday of October.